THOUGH he refused to admit it, Garry Hill will be mightily relieved to have escaped this feisty encounter with all three points. It took a Giuseppe Sole penalty eight minutes from the end to separate ­Woking and old Blue Square South adversaries Dartford at Kingfield. And even that came from a foul on Loick Pires that looked to be more outside the box than in. But the late drama of the winner does not even begin to scratch the surface of a fixture teeming with chaos. 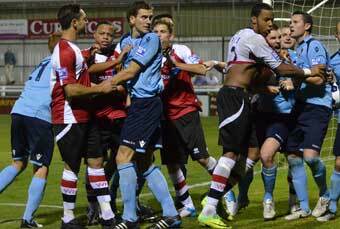 Add to the mix the fact Dartford were reduced to 10 men when Lee Noble was dismissed midway through the first-half. Not that Hill was expecting anything less than a brutal examination from a Darts side that tirelessly chased the Cards for so much of last season. He said: “There are no games in this league where you can turn around and expect to win. “What you can expect, whether it is home or away, every game you play is going to be hard. “Dartford certainly had the upperhand in the first 20 minutes and we knew they were going to be a tough, competitive team. “We knew that it would be hard – even more so as we were both beaten on Saturday. “One goal was always going to win it and that’s the dividing line. Woking looked all at sea in a woeful opening half-hour as they failed to create any chances of note against a solid looking Darts backline. At the other end, the visitor’s decision to go with two target men up front gave them the early edge. A sliced clearance over his own crossbar was the only way Joe McNerney could relieve the pressure caused by Adam Green’s dangerous ball across the face of goal. The subdued Pires was hacked to the ground twice in the opening 15 minutes but it was Dartford who were benefitting from Woking’s set-pieces. Noble was allowed to break from deep inside his own half and threaded a pass to Jacob Erskine down the right channel. The lumbering forward had the beating of Brett Johnson, but Aaron Howe was more than equal to his tame shot at the near post. Bradley Bubb eventually tested Louis Wells in the Dartford goal on the half-hour mark, jinking into the area before drawing a smart save. But it was five minutes of madness from dangerman Noble that turned the tide and handed Woking the initiative. After scything down Kevin Betsy on the edge of the area, the Dartford midfielder then arrived late on Mike Cestor and was duly dismissed by referee Dean Treleaven. On the sending off, Hill said: “It was a big decision but it was the right ­decision – both fouls were bookable ­offences. The dynamic of the match shifted and Woking ended the half in the ascendancy. Bang on half-time Lee Sawyer travelled almost 50 yards before releasing a shot straight at Wells. And a minute into stoppage time, on-loan forward Brett Williams produced a gut-busting run of his own before releasing a shot at the keeper. A reluctance to recycle possession stifled Woking’s progress at start of the second-half. But when Sawyer’s corner was headed clear by Jacob Erskine, Adam Newton controlled the ball on his chest and unleashed a swerving strike that seemed destined for the top corner until the fingertips of Wells intervened. Bubb was lucky to see Danny Harris toe-poke well over from a narrow angle after the Woking winger surrendered possession in his own box with an hour played. As the game moved into the final 10 minutes, Sole stepped up to demonstrate why a player of his calibre should not be warming the bench. Pires latched on to McNerney’s incisive long throw and was pulled to the ground as he surged into the area. Dartford players disputed the decision, none more so than Wells, who picked up a caution for moving the ball from the spot as Sole readied himself. Unfazed, the classy forward sent the keeper the wrong way, slotting the penalty into the bottom left corner. But there was more chaos for officials to address after the goal as Wells and Sole squared up before dragging a melee of players into the advertising hoardings. One fan, who entered the pitch, was ejected from the stadium and play finally resumed. One sour note was the sight of match-winner Sole hobbling out of the ground on crutches. Hill will be praying his star forward makes a speedy recovery.